In this installment of our favorite movies set or depicting New York City, Silvio weighs in. What a controversial film. There was massive pre-premiere hostility in the form of protests by Hispanic groups about the treatment of Hispanics in the film. It did nothing to stop the release and did everything to increase its box office draw. 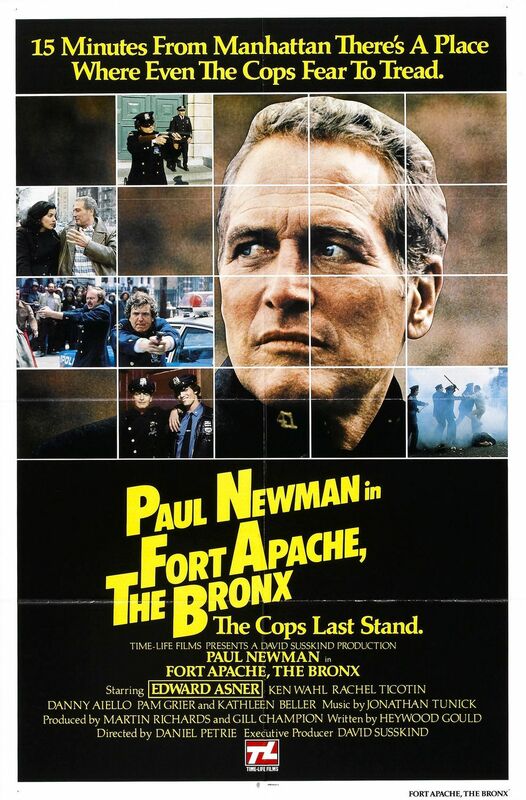 Regardless of the content, controversy or Paul Newman’s beautiful blue eyes, this movie at the time was a cinematic pariah but today is a visual snapshot of a Bronx I remember. In the mid 1980s, I worked in the very area they used as a backdrop. I worked at two different knitting mills on Third Avenue between Tremont Avenue and 176th Street. Before that, my father worked there in the ’60s and ’70s. As a toddler and whatever it is that is the next stage after toddler, I ran around the filthy floors that later in life I would patrol as a supervisor in a knitting mill. 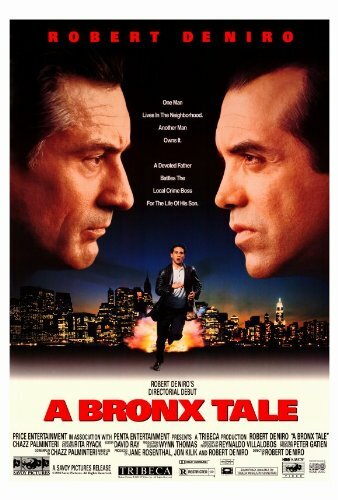 One of the reasons this movie resonates with me is the authentic Bronx locations. When Paul Newman and Ken Wahl chase after a purse snatcher, the event starts right at the corner of Third and Tremont Avenues. The building behind the police car is Expert Knitting Mills, where my father and I worked. In fact, the corner clearly visible behind the screeching police land yacht was a pizza parlor where I spent many a lunch break. The police chase the thief up the steps of Tremont Park. In the scene blocking Newman, the facade on the building directly behind him are the windows of my knitting mill. Just behind those windows were huge tables and huge scissors where I dropped off knitted pieces for quality inspection from the owners. 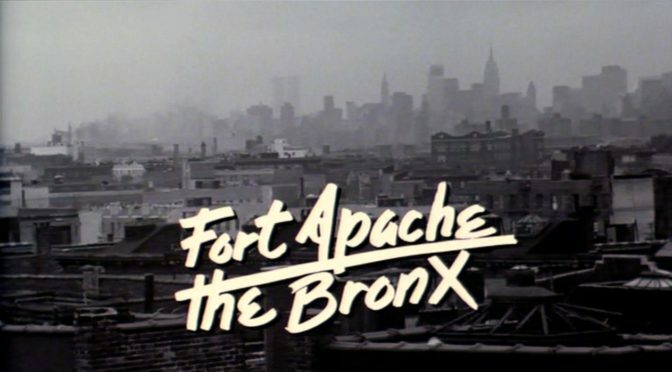 The movie’s location supervisor did a great job in identifying visual representations of the Bronx at that time. The final scene features a genuine backdrop of the burned-out South Bronx that could never be recreated in a studio with master prop and studio coordinators. Today that backdrop is gone. Fortunately, it’s lost to history and preserved only in pictures and film. Four heavily armed men daringly kidnap and take hostage an entire New York subway train with passengers, gripping the city in paralyzing suspense. They pledge to carry out hideous consequences if their ransom demands are not met within one short hour. The only way to teleport the viewer of this fine thriller is to set the scene in an actual subway car under New York City. 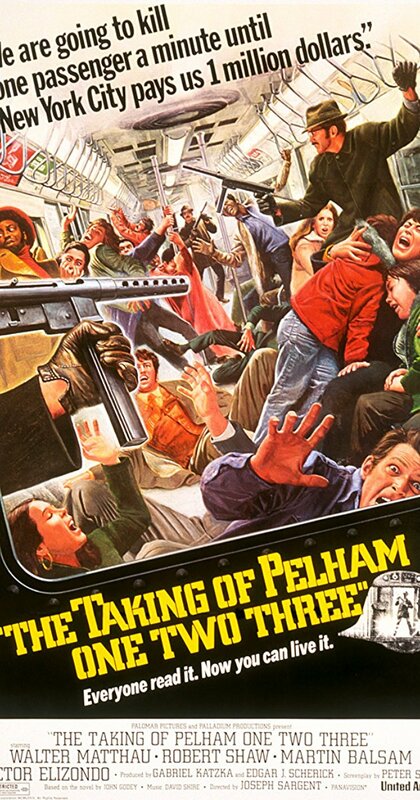 That’s exactly what the creators of the original “The Taking of Pelham One Two Three” (1974) did. Court Street Station, an abandoned subway station since 1946, doubled from different angles as two of the stations depicted in the film, 28th Street and Grand Central. A stretch of track and an actual subway car were also used, extending the realism of the drama. Today that abandoned station serves as the New York City Transit Museum. Above ground, wide shots of the desperate car and motorcycle transportation of the ransom money were shot on location through Centre Street, Park Avenue, Astor Place and 28th Street. A wonderful scene with uniformed police and the film’s New York mayor is captured with the backdrop of the 28th Street subway entrance. Earlier in the film, one of the four gunmen, Mr. Green, portrayed by the late, great Martin Balsam, is seen descending into the 59th Street subway entrance. Near the end of the film, when he is seen exiting the subway, it is through an actual subway grate in the sidewalk on Union Square East (between East 15th and 16th Streets) in Manhattan. I love the incredible attention to detail this film took in using New York as its backdrop, but also equally important was the accurate representation of the character’s New York accents and attitudes. A fun fact: A train’s name designation comes from the originating station and the scheduled time it left the station. In the case of the film’s No. 6 train, it left the Pelham Bay Park Station in the Bronx at 1:23, hence Pelham 123. After the movie was released, the No. 6 train would never be scheduled to leave Pelham station at 1:23 a.m. or p.m. by order of the New York City Transit Authority. Growing up in the Bronx was incredibly diverse, fun, scary, exciting and many times eventful. I loved every minute of it — looking back at it through nostalgic glasses. The title character of “A Bronx Tale” goes through his own growing up in the tough streets of the Bronx, caught between his friends, the streets, the local mob men and his dad. This movie, directed by one of New York’s favorite sons, Bobby De Niro, was written by a Belmont native, Chazz Palminteri, and it is semi-autobiographical. 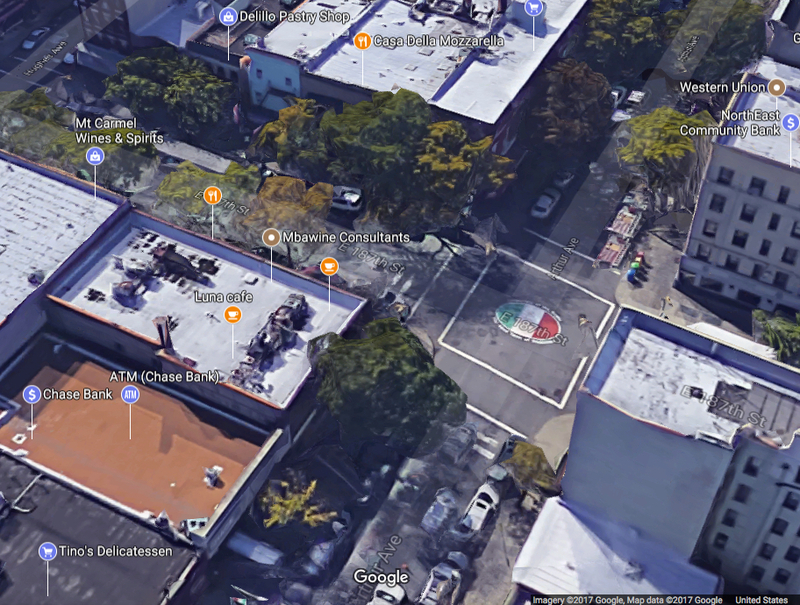 Today, there is even an emblem with the Italian flag’s colors in the road at the corner of Arthur Avenue and East 187th Street. That is the street that the narrator of the film, Cologero Anello, tells us he grew up in. An emblem with the colors of the Italian flag is painted on the street . He even points out his stoop. I remember having to explain what a stoop is to my friend from Alabama and his wife who were watching the movie with me and my wife. The characters were so authentically New York that it really sells the movie. The locations too give a real feel of 1960s New York, but the filmmakers had to go out of the Bronx to find the buildings still standing, unchanged that gave that authentic 1950 through 1960s New York look. The locations for Calogero’s stoop, the Chez Bippy bar on the corner and all the street scenes were in Astoria, Queens. Although it was not the Bronx, it was still New York. A fun fact: De Niro plays a bus driver. In order to drive the bus during filming, he got a commercial driver’s license with an airbrakes license after training with the New York City Transit Authority. 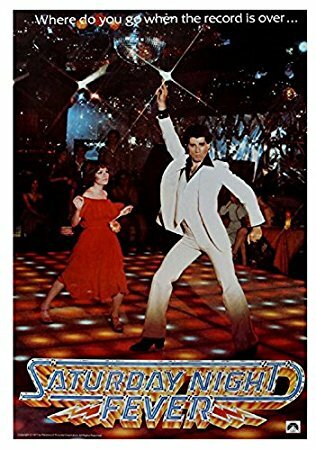 We find Vinnie Barbarino playing Tony Manero, a Brooklyn boy who works in his neighborhood paint store in Bay Ridge and he is the borough’s best disco strutter. He’s great on the dance floor or dancing on the Verrazano Bridge. Just don’t hit his hair! 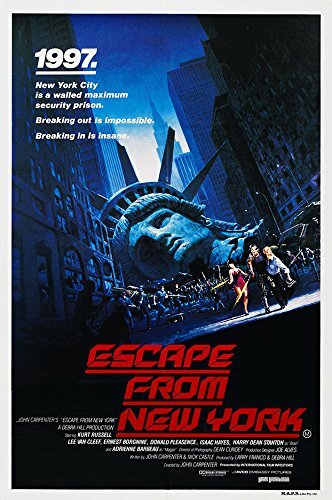 Except for the shots on Liberty Island and that famous cooper lady in the background, nothing else was filmed in New York. John Carpenter worked magic to make St Louis and Los Angeles locations take on the grit and attitude of the titular city in the lawless future of “1997.” Ha!